Hurtado, F. [et al.]. 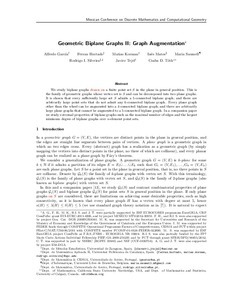 Geometric Biplane Graphs II: Graph Augmentation. A: Mexican Conference on Discrete Mathematics and Computational Geometry. "Mexican Conference on Discrete Mathematics and Computational Geometry". Oaxaca: 2013, p. 223-234.